My alarm clock went off at 1:00 a.m. Tuesday, September 12, 1978, awaking me from my 3.5 hours of sleep. The sky was clear and it was time for comet hunting! 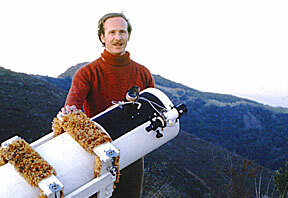 I quickly dressed, drove the 17 miles to the 3,300 ft. level of Loma Prieta in the Santa Cruz Mountains, and set up the telescope. Loma Prieta, a 3,800 ft. mountain is a thirty-minute drive from my home in Los Gatos, California. I set up and observe from a wide section of the dirt road. There I have low horizons and fairly dark skies. The telescope I use is mostly homemade. I bought the optics and some of the hardware. The rest of it I designed and assembled myself. It serves its purpose very well and it sets up in under ten minutes. It’s a ten inch, F/3.8 system. The eyepiece, which I have improved on, gives me 36X, a field of view of 2.4 degrees, and an exit pupil of 8 mm (my eye measures up to 9 mm across). 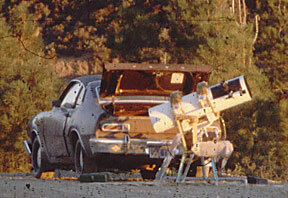 I began using this telescope in October 1975, after using a 4-inch, F/5 reflector for my first 200 hours of comet hunting. Earlier this year when my ten-inch mirror was being coated I again pressed the smaller telescope into service. It was quite windy on Loma Prieta that morning. I estimated gusts up to 40 mph. Later in the morning, it blew my clipboard partway across the road, but I’ve learned to brave cold temperatures, strong winds, heavy dew, and fatigue which are all part of comet hunting. So, at 2:10 a.m., September 12, 1978, I began Comet Hunting Session No. 691. I went out there that morning expecting to find a comet just as I had on all of my 690 previous sessions. I would not comet hunt if I did not expect to find a comet. This does not mean that I am disappointed when I don’t find a comet. I see success in comet hunting as something other than finding a comet – many times there is no discoverable comet up there when I am sweeping. My greatest failings have been to miss a comet later discovered (I’ve done that a few times), not seeing everything (such as galaxies and clusters) down to at least mag. 10.5, or worse yet, sleeping in when the sky is clear and the moon is not up. I view these things as my failures and I work hard to prevent them. When I began Session No. 691, I had 1697.5 hours of comet hunting. I began my systematic search for a comet on January 1, 1975, after spending some 25 “uncounted” hours, and some study into comet hunting – all to prepare myself for this exciting field. I average 460 hours of eye-to-eyepiece sweeping a year. This is by far more than any other American comet hunter. The main reasons for this are the weather and lack of any other branch of astronomy for me. Here in this part of California, we have been averaging about 120 cloudy nights a year. This leaves 245 nights, 60 of which are “mooned out”. During the remaining 185 or so clear, moonless nights, I observe for about 185 mornings or evenings a year. Because more comets are discovered in the morning sky, I spend two-thirds of my comet hunting time after midnight. To help me keep track of what I’ve swept and what I still have to sweep I have divided the sky into 68 sections, each of which takes 25 to 45 minutes to sweep. The sun hides a few sections each month but I still manage to cover 60-65 sections per month – nearly the whole observable sky. The only area I never cover is a 300 SQ. degree area in Coma Berenices. Before I became involved in comet hunting, I was working with other branches of astronomy. My sister first interested me in meteors when I was about 8. I received my first telescope at 13 and, some three years later I replaced my 2″ refractor with a 6″, F/8 Criterion Reflector With this telescope, during my first year I observed all the Messier objects from my backyard in Concord, California. I then went into astrophotography and have had several of my photos published in some of the smaller astronomy magazines – most of which have gone out of business. In late 1974 I realized I could discover a comet if I stuck to it long enough. I heard that 300 hours of searching could be expected before finding a comet. I needed a program of some sort to keep me observing, so I took up comet hunting. On September 12, 1978, I covered two Polar areas and one Southern area – all of which I had covered only two weeks ago. After 2.5 hours, at 5:10 a.m., I swung the telescope southward and began sweeping Area #60. After about five sweeps of the area, I picked up a faint patch of diffuse light, about 2 degrees SSW of the star Sirius. It was 5:16 a.m. I was excited. I knew this area rather well and I knew this area was supposed to be clear. However, I have taught myself not to get too excited as I had serious work to do on this object. I also had to try to prove this to be something other than a comet. First Check: Star Charts – I keep the Pleso Field Edition next to me. I checked Chart #XIII and saw only nebula 2283 here. I checked through the telescope. #2283 was supposed to be slightly E. of where this object was so the object that I was observing was not on the chart. Second Check: Catalog – My Revised New General Catalog would list anything I would ever see. I keep it in the car. I looked up the position and found nothing listed. So far, so good. Third Check: Higher Power – Under 100 power it still did not resolve. It looked more promising all along. Fourth Check: Motion – A comet will appear to move against the stars within an hour or so. So I drew three sketches of the area. Fifth Check: Glare from Sirius – As I moved the tube, the object moved with the stars. It was not glaring. I even rotated the tube. At that point, I got excited and started jumping around. 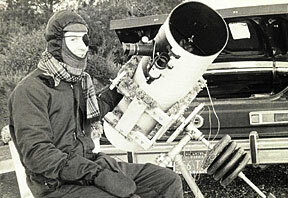 Don Machholz bundled up and ready for a cold night of comet hunting at Loma Prieta in 1978. However, the sky brightened before I could detect motion. So, I went home, measured its exact position on a star map, and later that day sent it to the Smithsonian Astrophysical Observatory via telegram. I called it a “possible comet”. I wanted to confirm it myself. On Wednesday, September 13, I got up at 2:00 a.m., went up to the mountain and calmly did one hour of comet hunting while waiting for the comet to rise. Shortly after 4:00 a.m., I turned to the area but could not find the comet in the previous day’s position. Instead, it was nearly a degree further south. It had moved! It was a comet! I rushed home and both telegraphed and called the Smithsonian Observatory. Dr. Brian Marsden said that no other report of this object had been received but it still had to be confirmed by a professional observatory. That was his job. It was an exciting day at work. Work is usually exciting anyway. I work in an optical lab making lenses for eyeglasses and we have a good sociable group. At work, we also have a Telex machine connected with the Smithsonian. On Wednesday I kept an eye on it for possible confirmation reports. None arrived. I wondered quite a bit about this eleventh-magnitude object. If it is moving southward, why hadn’t anyone in the Northern Hemisphere observed it? Additionally, it appeared to be moving away from the sun. Had it been undiscovered, yet visible, for these few months? On Wednesday evening I made several phone calls. I had discovered a comet and even if it was still unofficial, it was as good as official. I heard many excited people on the other end of the telephone line. I also called Edgar Everhart who lives near Denver, Colorado. 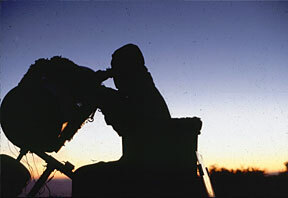 He is a good friend of mine and a comet hunter, having discovered two comets in the 1960s. I asked if he could observe the comet for confirmation of some sort, and he happily agreed. The next morning two members of the San Jose Astronomical Association, Gerry Rattley and John Rhodes, met me up at the observing site and saw the comet also. It was still moving south and at magnitude about 10.7. Shortly after getting home from observing the comet on Thursday, September 14, I received a phone call from Dr. Brian Marsden, the Director of the Smithsonian Observatory. “The comet has been confirmed”, he said. “It is now known as Comet Machholz, 1978L.” Now that was exciting! What happened during the next few days was quite an ordeal, of sorts, yet the type of experience which I wish everyone could go through. Penny Pinschmidt and Ed Schell, both also from the San Jose Astronomical Association, did a very good job of handling the publicity. All day at work I was receiving telephone interviews, and when I got home the pace picked up. About 8:00 p.m. I received a call from a T.V. station. They wanted to do a live broadcast for the 11:00 p.m. News and the camera van was already on the way out. At 9:30 p.m. they arrived at my house. We went up to the mountain and did a minute or two of the live interview over one of San Francisco’s largest T.V. stations. They also did some taping for playback the next night. Additionally, another T.V. station interviewed me the next night and taped for the 11:00 p.m. News on their station. The newspapers and radio stations were keeping me busy, too. The Associated Press called me at work and then sent the story to all its news outlets. An area newspaper is doing an in-depth article on my comet hunting, too. Radio Station KNX, in Los Angeles, interviewed me, as did WBAL from Baltimore. At 4:30 a.m., Charles Osgood from CBS called me and interviewed me for his “First Line” report which is heard all over the United States. Yet I know that all this is short-lived. In another week most people will be saying, “Comet what?” But – that’s alright with me. I didn’t do this for the publicity or for money. Speaking of money, my comet hunting costs: I use 2.5 gallons of gas each time I go to the mountain to observe and for 180 trips a year, that’s over $300/year, not to mention the 6,300 miles of driving each year for my comet hunting. I am presently planning to continue my comet hunting but I’m not sure if I will continue at the rate I now do. I must say, though, it’s been a challenge and it has been wonderful to be able to be involved in God’s handiwork in this way. As I write this one week after the comet was confirmed, Comet Machholz is getting further and further from the sun. It was at its closest approach at 1.72 A.U. on August 13.70. It is in a retrograde orbit and for the next week or so; it will be getting slightly closer to the earth. In about a week it will slip below my Southern Horizon never to be seen by me again. What is there rising for us over other horizons in the heavens around us?